The winter season is a time when many people visit with friends and family and share in the spirit of the holidays. Our bunnies are part of our family, and we want them to have a safe and happy holiday, too! Here are a few ideas from our volunteers about including people and pets in the celebration. For families who celebrate Christmas, protecting the Christmas tree from pets isn’t unique to rabbit owners. Cats and some dogs (especially puppies) often need assistance to keep themselves, and the tree, safe. One of the simplest solutions is to put an indoor fence around the tree and presents when the rabbit or other four legged pets are in the room. Wire cubes may be constructed into a fence with zip ties, or a dog exercise pen may be used to fence off the tree. A tree, with its shiny lights, glittering ornaments, and wrapped presents covered in paper and bows, is a tempting place to play. Christmas, Hanukkah, and Kwanzaa presents may be kept in a place out of the rabbit’s reach. If you have tinsel on your tree, be very careful that it doesn’t wander to where your rabbit can access, chew, and ingest it. If you have a smaller tree, or other holiday plants, they can be placed atop a piece of furniture out of the rabbit’s reach. If you use a kitchen or dining table, remember to push the chairs in so they don’t become a bunny ladder. Also, be aware of leaves that may fall and keep them out of the bunny’s area. If you have a smaller tree, or other holiday plants, they can be placed atop a piece of furniture out of the rabbit’s reach. If you use a kitchen or dining table, remember to push the chairs in so they don’t become a bunny ladder. Also, be aware of leaves that may fall and keep them out of the bunny’s area. Holiday lights and electric window candles should be bunny-proofed if they have cords that may be accessible to rabbits. For tips on bunny-proofing electrical cords, check out our November post. If the rabbits have taken over your house anyway, you can get holiday rabbit toys and accessories specifically for them! Cardboard Safari makes a recycled cardboard Christmas tree in two different sizes. The plain brown ones are perfect for rabbits to chew. Hang a few toys on it and you have a very festive and exciting holiday toy! You may also find holiday themed rabbit toys that make great presents! Our local Bunderland Toy Emporium has some, and others are available on Etsy. Target has cat scratching and hiding boxes in holiday themes. These can work great for small to medium sized rabbits, too. As beautiful as they are, poinsettias are toxic to pets, including rabbits. If you have a few in the home, simply keep them up high where the rabbit cannot reach them, and be careful to collect any fallen leaves before the rabbit finds them. Small, organic rosemary bushes, cut in the shape of a tree, are a pet-friendly alternative and they smell delightful! If you love baking over the holidays, or have a child who loves making holiday cookies, you can even make some homemade treats for the rabbits! I can almost guarantee you will not be as tempted to eat them as you might a batch of gingerbread cookies. If you have a food dehydrator, you can also make some simple treats by dehydrating some of your rabbit’s favorite fruit. Some bunnies love visitors, and others are stressed by additional people coming and going. 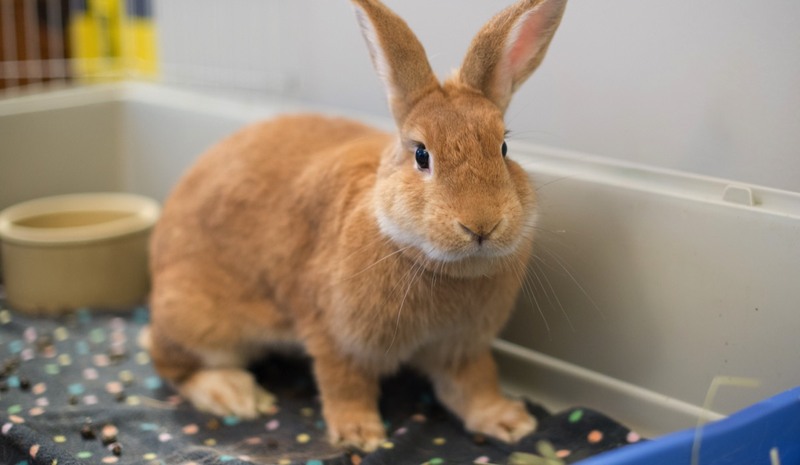 Well intentioned people who aren’t rabbit savvy could unintentionally harm rabbits or other pets by trying to pick them up or feed them things they shouldn’t have. When I have visitors, I keep parsley and some treats cut into small pieces at the entrance to the room. I ask visitors new to the rabbits to not try to touch or pick up the rabbit, but instead just give them a treat. This ensures a positive experience for the rabbit and family member. After all, is there anything cuter than a rabbit eating a stalk of parsley?